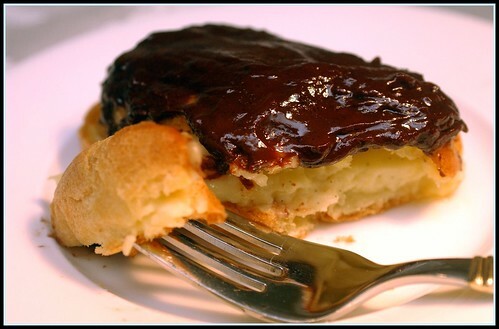 Sweet Sadie's Baking: My First Daring Bakers Challenge...éclairs! My First Daring Bakers Challenge...éclairs! Oh yes...I waited eagerly to take part in my first challenge with the Daring Bakers. Thank you to Meeta and Tony who chose chocolate éclairs from the book Chocolate Desserts by Pierre Hermé. And then the chocolate glaze. It went downhill here. After removing the cream from the heat, I added the chocolate …and then there was oil and chocolate. The more I tried to mix it the more oil there was. I added the butter, thinking that magically, by some miracle unknown to man, the butter would eliminate the oil. Pierre Hermes would not say to add the butter if this were not the case? I was sooooo surprised when it got more oily! I thought the oil was somehow coming up through my counter into the bowl! I kept trying to drain the oil and it kept multiplying. I had struck an oil well in my counter! After shouting at the oil well under my counter, I frosted the éclairs, hoping the glaze would not slide off and skid across the kitchen. After much deliberation with my fellow Daring Bakers, we think it is because I did not pour the cream over the chocolate in another bowl. 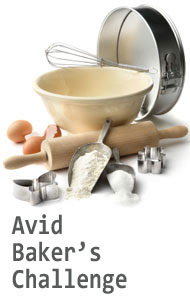 Maybe the cream was too hot - perhaps weighing the ingredients would have helped. If anyone thinks it’s something else, please let me know. They may not look fabulous, but they tasted great! At least my challenge tasters, Zac and Dan, ate them all! You can find the recipe on both Meeta's and Tony's blogs (as well as the pastry tips). The taste testers not only ate them up, we devoured them! They were awesome! More please?! Congratulations on your first successful challenge. And yes, even if all the components didn't work, you were successful. If it tastes good enough to be asked to make it again, it's a success. Congratulations on your first challenge! I too have made the mistake of feeling overconfident when I make something that I've made before. So glad you joined us! Ah, the joys of the challenge. Glad they turned out in the end. 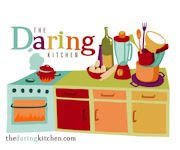 Welcome to Daring Bakers.